Little did he know the answer is the story behind the men who founded Black Diamond. Since 1861, the Black Diamond Coal Mining Company of Nortonville, California, had been extracting a low grade of coal and selling most of it in San Francisco, 35 miles to the southwest. San Francisco’s population had quadrupled since 1860. The growing city needed energy—lots of it. The company sent Victor Tull to the Green River region of Washington Territory to find a better grade of coal. In July 1880 Tull located a seam just above a lake in section 14, two miles west of the Green River. The area was wilderness covered by an old-growth forest. A few Indian trails might be found but there were no roads, homes, or settlements. It was virgin country unreachable except by foot or horseback. B.B. Jones was dispatched to the site in the fall of 1881 to open a prospect tunnel. Jones Lake in section 14 now bears his name. The following spring Victor Tull shipped 880 pounds of coal to San Francisco for testing. The successful results prompted mine superintendent Morgan Morgans and company president Pierre Barlow Cornwall to head north to confirm these reports. The coal prospect was situated among tall stands of timber that could support an underground mine’s workings and lumber for homes and buildings. The Black Diamond Coal Mining Company decided to acquire the property, open a mine, and build a town. The town’s name would be the same as the company’s: Black Diamond. Only one thing was missing—a railroad to transport men and machinery to open the mine and trains to haul coal to port. A PCRR passenger train at the Black Diamond Depot (now home to the Black Diamond Museum) headed towards Franklin. 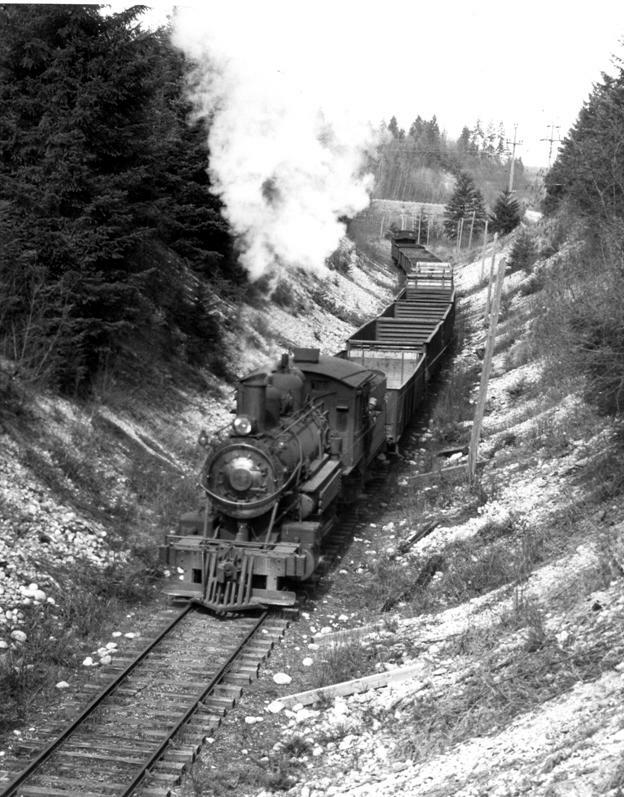 This circa 1915-1920 photo comes courtesy of the Pacific Northwest Railroad Archives in Burien. Photo # WWAPC0246. Meanwhile the growing city of Seattle had its own needs. Stung by the Northern Pacific (NP) Railway’s decision to establish its West Coast terminus in Tacoma, the entrepreneurs of Seattle decided to build its own railroad. 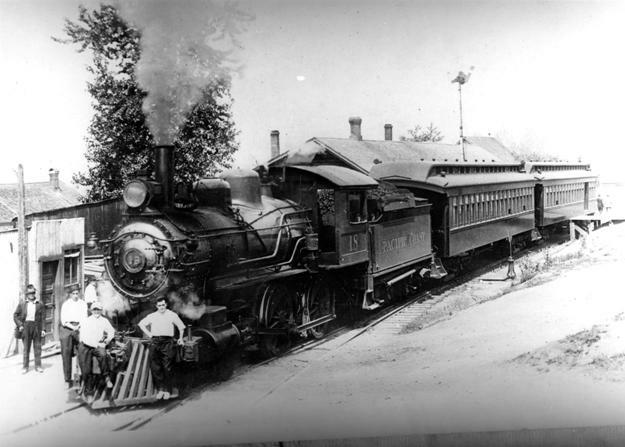 The Seattle & Walla Walla Railroad reached Renton in 1877 and later Newcastle, but no farther. The venture failed in 1880 and was purchased by Henry Villard’s Oregon Improvement Company (OIC) and renamed the Columbia & Puget Sound (C&PS). Villard also gained control of the NP through a famous blind pool on the stock exchange, thereby developing a monopoly over Northwest transportation. Around the same time, Bailey Willis, a prospector working for NP, found a coal exposure along the Green River of the same seam that Tull had uncovered in Black Diamond. Willis named the coal seam McKay and the town that sprung up around it was named Franklin. Empowered by NP’s land grant to every odd section of land, OIC finagled control of section 19 on the Green River and assumed ownership of Franklin. The coal, however, would still need to be shipped on someone’s railroad. Morgans and Cornwall needed the C&PS rail line extended from Renton up the Cedar River valley to Black Diamond. They struck a deal with Villard and railroad construction began in 1882. The narrow-gauge railroad reached Black Diamond on December 12, 1884, and then connected to Franklin. The extension took more than two years to complete, mostly with Chinese labor who lived in a settlement on Jones Lake. An 1885 census showed the majority of 175 laborers to be Chinese, but they departed shortly after the railroad was completed. Coal was shipped from Black Diamond in April 1885 and Franklin shortly thereafter. In time branch lines were extended to Taylor (coal and clay tiles), Bruce (coal), Lawson (coal), and Kummer (coal and clay). Strikes, mine disasters, and the Panic of 1893 eventually sent the Oregon Improvement Company into bankruptcy, pulling its sister company, Columbia & Puget Sound Railroad, along with it. In 1897, those pieces to the puzzle were reorganized into the new Pacific Coast Company, combining a coal subsidiary, Pacific Coast Coal; a shipping concern, Pacific Coast Steamship; and the C&PS rail line, under one corporate umbrella. That same year narrow-gauge rails were replaced by standard gauge allowing C&PS freight to easily transfer to other lines. A PCRR locomotive pulling empty coal cars towards Black Diamond. This 1944 photo by Harold Hill comes courtesy of the Pacific Northwest Railroad Archives in Burien. Photo #WWAPC0144. Within the next few years the Pacific Coast Coal arm of the conglomerate would acquire the Black Diamond and Lawson mines, adding to existing operations in Franklin and Newcastle. Eventually its reach would include mines in Issaquah and Burnett. The C&PS was renamed the Pacific Coast Railroad (PCRR) in 1916. At its height PCRR track spanned 55 miles throughout the Seattle area. As mines begin to close branch railroads were no longer needed. The Lawson branch of PCRR was the first to be abandoned in 1918; Bruce in 1922; followed by the Kummer branch’s closure in 1931; Franklin (renamed Pacosco) in 1934; the Newcastle line shortened to Kennydale in 1934; and the Taylor branch discontinued in 1945. By 1948, the PCRR had been reduced to one line running from Black Diamond through Maple Valley and Renton to Seattle. PCRR continued operating until 1951 when it merged into the Great Northern Railway. In September 1958, a Great Northern locomotive was commissioned to pull several passenger cars to Black Diamond, as part of an excursion by model railway conventioneers from Seattle. April 1969 saw one of the last trains leave Palmer Coking Coal Company’s Mine #11 facility in Black Diamond with a load of coal destined for the University of Washington. On March 3, 1970, the Chicago, Burlington and Quincy Railroad; the Great Northern; and the Northern Pacific merged to become Burlington Northern Railroad. The rail line remained operational until September 22, 1970, when the last train left Black Diamond. The spur from Henry’s Switch to Black Diamond was not officially abandoned until 1982. Maple Valley saw its final train pass through town March 15, 1980, when the Chicago, Milwaukee, St. Paul and Pacific Railroad abandoned its Pacific Extension. Most of the tracks and ties along the remaining lines were removed in the early 1980s. The repurposing of railroad ties for landscaping and rail for scrap metal was a good business during those years. Most portions of the right of way were owned “fee simple” by the railroad and those segments were acquired by King County Parks as part of a national rails-to-trails program. Some segments reverted to adjacent landowners following abandonment. In time much of the former rail route between Renton and Black Diamond became the popular Cedar River Trail, with future plans to extend it south to Flaming Geyser on the Green River. 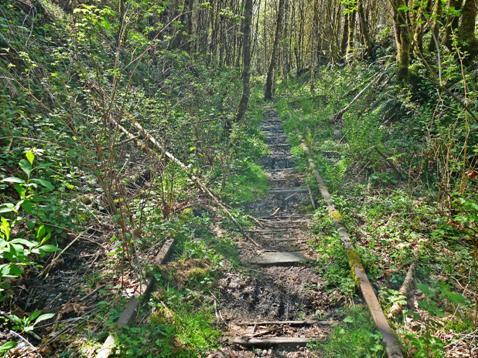 One section of historic railroad, however, was left untouched—covered by decades of vegetation. This small part of the line remains in Black Diamond. Its parcel was acquired by Plum Creek Timber as part of the breakup of Burlington Northern into railroad, timber, development, and mineral divisions. Whether by inattention, bureaucratic lapse, or luck, that short span remains intact—a 135-year-old time capsule embodying the blood, sweat, and tears that brought Black Diamond and Franklin to life. On a spring day, Bob Dobson discovered that even rusty rails have a story to tell. Growing up just a few miles from the Nortonville and Summersville townsites and then moving 5 miles from Black Diamond Washington as an adult really makes the world feel a bit smaller! Excellent article.